Charlotte Collins is reunited with Mr and Mrs Darcy in this mystery novella, but a theft at Rosings casts a shadow over the occasion. Blame for the crime soon falls on an obvious suspect, but is the allegation true? Needless to say, it’s left to Charlotte to discover the truth, helped by her childhood friend and the local villagers. Once again, Mark Brownlow brings Jane Austen’s Hunsford and Rosings Park to life in this Pride and Prejudice sequel. Spend some time with Charlotte and the Darcys, the indomitable Lady Catherine, the inimitable Mr Collins, a troubled Colonel Fitzwilliam, an unpleasant newcomer, concerned servants, and curious villagers. 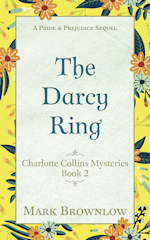 The Darcy Ring is a quick and enjoyable Regency read, best consumed with a cup of tea or a glass of wine, a packet of biscuits, and a comfy armchair.